Regardless of your taste in entertainment, Chicago has it. The city has proven over and over again, they're a force to be reckoned with. New York and Los Angeles has nothing over Chicago!!! 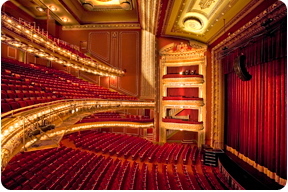 The LaSalle Bank Theatre opened as the Majestic Theatre in 1906 and was Chicago's first million-dollar-plus venue and the city's tallest building at the time. A hot spot on the vaudeville circuit and later host to such luminaries as Harry Houdini and Lily Langtry, the Majestic closed during the Great Depression and was shuttered for 15 years. Much of the original design was retained when the theatre was remodeled and reopened in 1945, in time for the heyday of favorites like Carousel, South Pacific, and Guys and Dolls. More recent production highlights include the Chicago premiere of Rent, the Tony-Award winning Sweet Smell of Success and the pre-Broadway, world premieres of Billy Joel and Twyla Tharp's Movin' Out and Monty Python's Spamalot. 1410 S. Museum Campus Dr.